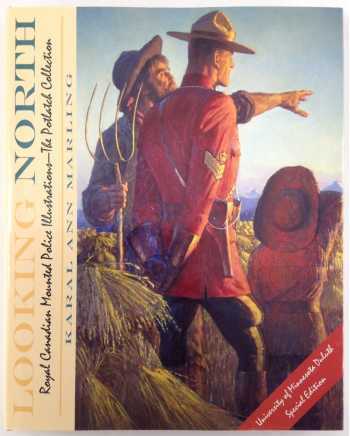 Paintings of Mounties commissioned by the Northwest Paper Company 1931-1970. Featuring 66 paintings by Arnold Friberg, but also 15 other artists including Hal Foster, Frank Godwin, J. Allen St. John, and Burne Hogarth! This is the University of Minnesota Duluth Special Edition with different paintings on the dustjacket. The Mountie wore his heart (and ours) on his bright red sleeve; he stood for integrity, bravery, and a whole range of Victorian virtues that had been banished from the abstract art of the modern, 20th century. The big calendars that carried these images were Northwest Paper Company's pride and joy. To promote high-quality paper to the printing trade, it was crucial to show how well it reproduced the intended colors---how well it "printed." Chicago ad man Frank Cash had the answer: The red Mountie tunic and the vivid hues of the outdoor landscapes would test the printing qualities of Northwest paper to its limits. The heroic male figure would appeal to the jobbers and printers; theirs was, in the 1930s, strictly a man's world. LOOKING NORTH features 140 color illustrations by Arnold Friberg, Hal Foster, and 14 other artists who created these stunning story-ads for the Northwest Paper Company in Cloquet, Minnesota, between 1931 and 1970.